A statement of love doesn't have to be big to be meaningful, nor does it have to be complicated. This is clearly seen in this sweet and sophisticated heart pendant. This simply-styled piece sets a small round diamond in the center of a shining 14K white gold heart that hangs elegantly on a coordinating 18-inch white gold box chain. This is a versatile look that accents any outfit and looks beautiful on its own or with other white gold styles. 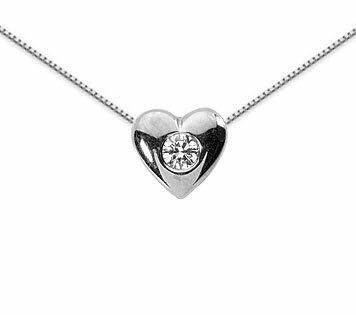 We guarantee our Small Diamond Solitaire Heart Pendant, 14K White Gold to be high quality, authentic jewelry, as described above.